Mushroomy Kingdom across the series. Mushroomy Kingdom (いにしえっぽい王国, Ancient-ish Kingdom) is a stage in Super Smash Bros. Brawl based off levels in Super Mario Bros. This stage is a 2.5D (3D structure in a 2D perspective) replica of the original World 1-1 with enhanced graphics and a deserted look. Ruins can be seen in the background and life is absent apart from the fighters. Game director Masahiro Sakurai stated in the stage's update on the Smash Bros. DOJO!! that he wanted to create the impression that the kingdom had been abandoned since its initial appearance in 1985, 23 years prior to the release of Brawl. 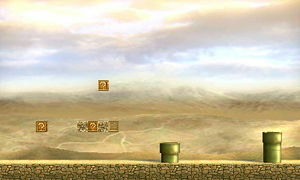 The stage returns as a familiar stage in Super Smash Bros. for Nintendo 3DS, albeit with the World 1-2 version removed; in that game, Dr. Mario is fought here when being unlocked. The stage also reappears in Super Smash Bros. Ultimate, and once again the World 1-2 version of the stage is cut altogether like in Super Smash Bros. for Nintendo 3DS. The stage scrolls to the right slowly and one can see familiar Mario landmarks like the flagpole and castle at the end of the level, but it keeps on scrolling, looping back to the level's start. There are both destructible Brick Blocks, as well as the indestructible ? Blocks, which release an item when struck, similar to their Melee appearance. Blocks that contained multiple coins in Super Mario Bros. will release multiple items (up to three) if hit more than once. In Brawl, Mushroomy Kingdom can also load as World 1-2, an underground stage. 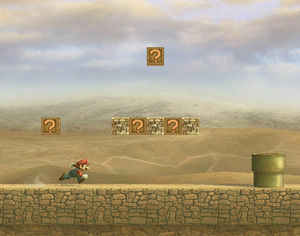 This stage has many Brick Blocks that need to be destroyed to pass through, and ends at the same pipe that it did in Super Mario Bros, but players must jump over it to continue fighting. Originally, this was where the first Warp Zone was situated. Its removal makes it one of the only features of the two levels that was not recreated for Brawl. In Super Smash Bros. for Nintendo 3DS, the Ω form features a flat platform made up of the blocks that form the steps towards the flagpole of the regular form with ground blocks as the base. The stage is set past the castle. The stage does not scroll, and the platform extends below the blast line. In Super Smash Bros. Ultimate, the Ω form and Battlefield form are identical to SSB4's Ω form; however, the floor of the platform is now just made of the ground blocks. The platform also does not extend below the blast line, and it is resized and reshaped to match Final Destination and Battlefield, respectively. The three soft platforms of the Battlefield form resemble the blocks that form the steps of the regular form. Worlds 1-1 and 1-2 as they originally appeared in Super Mario Bros. This stage is based on Worlds 1-1 and 1-2 of Super Mario Bros., and the stage is a mostly accurate replica of their layouts. However, several small changes were made to facilitate gameplay: all enemies and coins were removed, all Warp Pipes were made inaccessible, and World 1-2's Warp Zone was replaced with a loop back to the beginning of the stage. 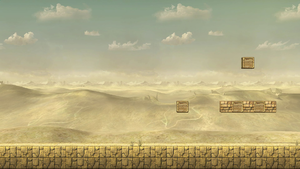 In World 1-1, the hidden 1-Up Mushroom block was lowered by a block, and the block the flagpole stood on was removed (except in Ultimate, where it is in the background). In World 1-2, the grounded Brick Blocks after the three pipes and near the exit were changed to ground blocks. However, two elements from Super Mario Bros. are retained: ? Blocks that release an item upon being hit, and Brick Blocks that break upon being hit. Additionally, the flagpole and castle found at the end of World 1-1 also appear, relegated to background elements. As stated before, the game director of the Super Smash Bros. games, Masahiro Sakurai, said in the stage's update on the Smash Bros. DOJO!! 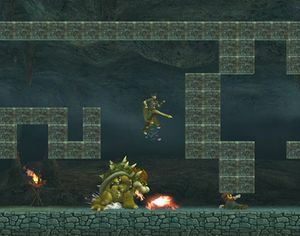 that he wanted to create the impression that the levels had been abandoned since their initial appearance in 1985, 23 years prior to the release of Brawl. Due to the stage's side-scrolling nature and ledges that can't be grabbed, this stage is banned from official tournaments. World 1-2 also has an unusually low ceiling, and it is possible to KO with some up throws at 0%. The blocks can additionally create caves of life, though this is more noticeable on World 1-2. Full worldmap for the original World 1-1. Full worldmap for the original World 1-2. Mushroomy Kingdom as World 1-1 in Super Smash Bros. Brawl. Mushroomy Kingdom as World 1-2 in Super Smash Bros. Brawl. Mushroomy Kingdom in Super Smash Bros. for Nintendo 3DS. Bowser and Little Mac fighting on the stage. Dr. Mario jumping on the stage. Meta Knight and Roy jumping towards a Fake Smash Ball on the stage. Meta Knight and Roy caught in the Fake Smash Ball's blast. Pac-Man throwing a melon on the stage. Sonic dashing on the stage. This stage's Japanese name is a reference to the previous Smash stages named Mushroom Kingdom in English, the Japanese names of which were more literally "Ancient Kingdom", referring to their retro designs. Mushroomy Kingdom is instead "ancient" as it appears in ruins (though its graphics still resemble those of Super Mario Bros.), so its Japanese name, translating to "Ancient-ish Kingdom", is a play on this variation on the idea. The stage's scrolling speed (for both versions in Brawl) is such that the stage makes exactly one loop in two minutes, the default time for a timed match. Players are unable to enter the pipes in this stage because they are grated up, as revealed by rotating the camera. On the World 1-2 version of this stage, it is possible to dodge Olimar's End of Day by standing on the very top of the level for the duration of his attack. During Sudden Death (where items are usually absent), players can still get items from ? Blocks. When the black palette of Mr. Game & Watch is used on World 1-2, he appears to be dark yellow. This could possibly be a reference to the color-changing sprites in the original Super Mario Bros.
Oddly, within the Album, the palette switches back to black. Instead of Space Jumping when off-screen like he does in the Subspace Emissary, Pokémon Trainer instead appears at the other side of the screen with no transition. If the game is paused while a Warp Star user is offscreen, the stage will zoom out completely. If a Poké Ball is on the edge of a block, it will continuously fall while a buzzing sound is played. If King Dedede were to grab Bowser while standing on the stack of blocks to the left of the first invisible block of the stage scrolling cycle, and Bowser were to hit the block to solidify it and then jump backwards onto the stack of blocks to the right of the block, Bowser will rapidly flip between his aerial grab and grounded grab animation. In the game files of Super Smash Bros. for Wii U, there are unused files for this level along with 3D Land; however, the only file remaining in each directory is the item parameter file. In Super Smash Bros. for Nintendo 3DS, standing on the revealed hidden block will move the player's character to the right at the same pace as the stage does. This does not occur with the other blocks on this stage. On the hazardless version of the stage, the item-holding Brick Block before the triangular set of ? Blocks is a normal Brick Block, rather than an empty block like the ? Blocks. This page was last edited on April 23, 2019, at 01:16.